Hi friends! Ahh I just love a new week, a chance to start fresh. It’s also the first full week of fall and I am all about the fall outfits! 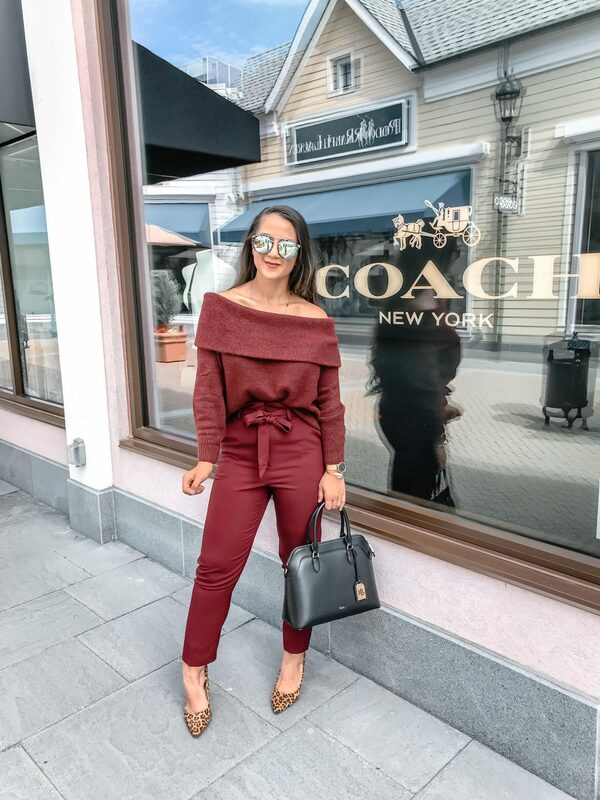 I love burgundy year round, but it’s such a fall-y color and I am so glad it’s “in” this season! If you work in an office, then you’ll want to grab a couple pairs of these paper bag pants! They are seriously so comfortable (feels like lounge pants) and super flattering! What I love is that they are super easy to style outside of work too. They also comes in a few shades as well. To complete this look, I wore my favorite pair of leopard pumps. For work, a black or white pair would go perfectly. Also, if you are looking to invest in a pair of leopard heels, these ones would be the ones! They are super comfortable and will make your outfit pop.